It is commonly believed that most people are satisfied with only one sleeping position-it could be side, back, or stomach-the entire night. However, there are a quite a few number of people who change their sleeping positions. This is what we call as “combination sleeper.” This refers to people who change from one position to another at least once as they sleep at night time. Since the comfort and support needed in every position vary, combination sleepers have different needs especially when it comes to pillows. We first cover the best pillows for combination sleepers and provide our ratings. Then we will discuss the main factors to consider when purchasing a new pillow so that you can make an informed decision. This pillow is composed of a fiber filled with gel. It lets you feel as if you are using down. It is not expensive and comes with a money-back guarantee of 30 days. Although this pillow does not provide you that luxurious feel as the authentic down pillow, its softness and flexibility are fit for combination sleepers, plus the price is budget-friendly. This down-alternative pillow is shapeable and soft, which allows combination sleepers to easily adjust depending upon their sleeping position. Since this is not expensive, anyone can easily access this type of pillow. A synthetic down pillow is not as durable as the authentic one and may not give the same luxurious feeling. A few customers expressed receiving finding mold on the pillow upon arrival. However, this issue can be included in the 30-day money-back guarantee. This pillow is filled with tiny pieces of memory foam. It has a zippered cover for you to conveniently remove the foam pieces to adjust to your desired loft. Shredded memory foam is a perfect choice for combination sleepers who want a supportive and responsive pillow. The adjustability feature of this pillow is certainly a plus. The adjustability of a pillow is important for combination sleepers, and this pillow can be adjusted in two ways. First, its foam can be added or removed to enable users to adjust the loft. Then, memory foam is a material that is highly responsive, thereby making this pillow moldable in so many ways. In short, this pillow can give the support that combination sleepers need. Memory foam is known to have high heat retention level, and regularly shaping this pillow can form clumps if not fluffed constantly. For those who prefer a pillow that has a consistent loft, this single-piece latex pillow is a good choice since it is highly responsive, which is a natural property of latex. This pillow is a great choice for a few combination sleepers who prefer consistent loft. This pillow certainly provides them with the comfort and support that they need. This pillow is composed of one-piece aerated latex that is wrapped with a 300 thread-count cotton cover. Latex is a material that is very responsive, which makes this pillow supportive especially to those who are used to sleep on their side. It has a consistent loft, which is great for combination sleepers who sleep on their back most of the time. 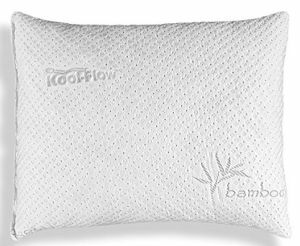 The consistent loft of this pillow could be an issue for combination sleepers who sleep on their stomach most of the time. A few customers also reported odor problems with single-piece latex pillows. 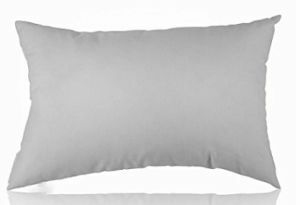 This pillow is made up of 100% down material, which is the highest quality kind of feather material. This pillow is highly shapeable and very soft. 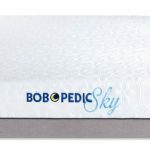 Since this is soft, has an adjustable loft, and is durable, a genuine down pillow like this brand can be a great choice for several combination sleepers. Even though this is made up of genuine down, you can still buy this at below $100, thereby offering you value for money. It is available in 2 variants: regular and firm. It is also shapeable, making it beneficial for combination sleepers, especially to those who spend most of their sleeping time lying on their stomach or side. This pillow may not provide the right loft for those who usually sleep on their back most of the time. Although this product offers value for money, this still may be costly for some people. With a record of positive reviews from verified consumers, this pillow is a great option for sleepers who prefer a responsive sleeping surface and consistent loft. If you do not want a noisy pillow and prefer a consistent mid-loft, the buckwheat pillow is an excellent option. Combination sleepers who sleep on their back most of the time prefer this pillow. Since this is filled with buckwheat husks, its loft is consistent. But this is till responsive, making it supportive regardless of the sleeping position. Buckwheat usually creates a noise upon moving, which could disturb combination sleepers as they switch position throughout the night. The loft of this pillow may be too much for stomach sleepers. When it comes to sleeping positions, each combination sleeper has different needs and preferences. A few can fall asleep in a single position and just simply wake up in different position. Some people also notice that they are constantly changing positions throughout the night and they keep on adjusting their pillows just to be comfortable. Almost all combination sleepers have a primary or main preference position, and usually, this is their initial position when they fall asleep. The advantages and disadvantages of combination sleeping are highly dependent on the position itself and the duration of the position. The following table briefly displays the advantages and disadvantages of the 3 major sleeping positions. Combination sleepers can get both disadvantages and advantages related to spine alignment. Through shifting positions, they can constantly reposition their body in such a way that they can be comfortable and supported. This way, stiffness, and pain can be prevented. However, regularly shifting positions has also some risks. They could probably lose the right alignment and support as they change from one position to another. For combination sleepers, using a pillow that can properly support the neck and promote proper spinal alignment is crucial to experience that restful sleep. How to pick the best pillow for combination sleepers? Combination sleepers need to consider several factors when planning to purchase a new pillow. A few of these factors are specific to combination sleeping, while some of these are generic and applicable to any person who is looking to buy a new pillow. What is your primary sleeping position? Before anything else, it is essential to identify your most preferred or comfortable sleeping position. If you are aware that you will be spending most of your sleeping time in a particular position or that you notice that you fall asleep in that certain position, it is a good idea to choose a pillow that functions well for that position. How frequently do you switch positions? If you notice that you usually wake up to change your position, you probably need to choose a pillow that can be conveniently reshaped or molded. You may also need a pillow that is less noisy so that it will not bother you if you reposition or reshape it in the middle of the night. Are you using extra pillows for support? In some sleeping positions, it is beneficial to use one or two additional pillows for added support. For instance, side sleepers are usually comfortable if they put a pillow between their knees as this can minimize lower back pressure, or stomach sleepers prefer to put a pillow below their stomach or pelvis to promote proper body alignment. Combination sleepers must consider using additional pillows for added support and comfort. Adjustable Height The term loft refers to the height of the pillow. Loft could be variable or constant. Those pillows with constant loft will not adjust to the shape of your head. A pillow with variable loft will easily adjust when pressure is applied on it; thus, it can conform to the shape of your head. Down and shredded foam are examples of materials that are variable, while buckwheat and one-piece foam materials are constant. Pillows with variable loft are beneficial for almost all combination sleepers. Regardless of your sleeping position, high-loft pillows can cause neck and spine misalignment, especially when you sleep on your stomach or side. Variable loft pillows are more responsive and can be conveniently reshaped according to your desired height. Firmness The firmness refers to the softness or hardness of a pillow; it determines the comfort level of a pillow. The quantity and materials used in the pillow can significantly affect its firmness, and plush pillows usually have a low loft. When talking about comfort, it is highly subjective. Thus, there is no ideal firmness that can be suitable for combination sleepers. But pillows with medium firmness are most applicable for all types of sleepers. Therefore, medium firmness pillows are most fitted for combination sleepers. Pillows that have various firmness options are also beneficial for them. Support Support refers to the capacity of the pillow to promote right spine and neck alignment. A pillow that is highly supportive can provide the right cushioning level, which can maintain proper head and neck alignment, thereby preventing pain and stiffness. Pillows that are made up of responsive materials — those that can adjust well to the applied pressure — are typically more supportive. Responsive pillows are most suitable for combination sleepers since they can easily be adjusted to maintain the proper head position regardless of your sleeping position. This way, the neck, and spine are properly aligned, preventing the neck to be positioned in an exaggerated angle. 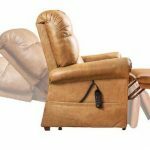 Durability Pillows that are composed of high-quality materials and created with great craftsmanship usually last long and provide the right level of comfort and support. Although the durability of high-end pillows is not the same as a mattress, it is expected that these can last up to 2 to 4 years. When a pillow begins to deteriorate, it will not be able to keep its loft level when it was still new. The comfort and support level it can provide will also go down. This could negatively affect the body alignment of combination sleepers. Moreover, durability is an essential factor to consider by anyone who is looking to purchase a pillow so that you can get the most value of your money. Pillow Type The composition of a pillow, particularly the materials that are filled with it, is among the most essential factors that highly impact the comfort and support that you can get. Therefore, it is always critical to examine the types of materials used before purchasing one. We cannot exactly identify the best type of pillow that is suitable for combination sleepers. However, generally, pillow types that are highly shapeable and flexible—like down, down alternative, shredded memory foam, buckwheat, and feather—are best for combination sleepers. These types usually have low to medium loft, are highly responsive, and can be easily adjusted to fit the position of the head. Down:This type of pillow is made from the very soft interior feathers of ducks and geese. A few down pillows are made up of 100% down feathers, but there were some that are composed of between 75% and 100%. One downside of this pillow is that it tends to form clumps. In addition, its price is also a bit high. Down pillows could be a great choice for combination sleepers since they have a modifiable loft that offers several shaping options throughout the night to conform with various sleeping positions. Feather: This type of pillow is also made from duck or goose plumage; however, the materials used in these pillows are the exterior feathers, which are not as light and soft as down. This has the same performance to down, which is soft and flexible. Although the price of these pillows is lower than down, they are typically durable. This has also the tendency to form clumps, and it needs to be regularly fluffed. Because of its adjustable and flexible loft, these pillows can be suitable for combination sleepers. Synthetic: Since the performance of down-alternative is the same as true down when it comes to moldability and flexibility, it can be considered as a great choice for combination sleepers. Memory Foam: Memory foam, or viscoelastic foam, was first invented by NASA and is popular for its contouring capacity. When weight or pressure is applied to the pillow, it responds by providing enough support and cushion. The support and comfort level that this pillow provides is its main feature. The major disadvantages of this are that it has high heat retention level and is not durable as other pillow types. Memory foam pillows can be composed of one-piece foam or small-piece foam known as shredded memory foam. One-piece memory foam has higher loft than shredded memory foam; therefore, it is not a good choice for combination sleepers. However, shredded memory foam that is both shapeable and responsive is a great choice for them. Memory foam pillows are also easy to clean and maintain. Click here for our detailed guide on how to clean memory foam pillow. Latex: This is a rubber material that could be synthetically or naturally produced. Similar to memory foam, latex pillows can also be made up of shredded or one-piece foam. Since latex is naturally bouncy and conforming, pillows that are made up of this material are supportive, has a high loft, and are firm. The disadvantages of this type of pillow are that they are usually costly, have few options, and are heavy. 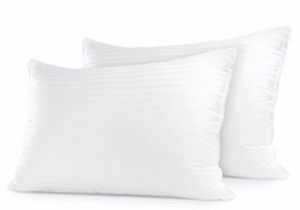 Shredded latex pillows may be suitable for combination sleepers, but these are more costly than shredded memory foam. One-piece latex could be a great choice for combination sleepers who have the tendency to lie on their back most of the time since the consistent loft could be helpful. 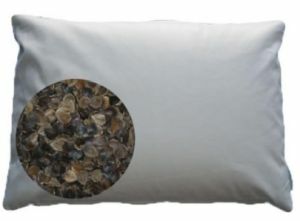 Buckwheat: These pillows are composed of hundreds of buckwheat husks (the tiny parts of the exterior of a kernel). These are highly moldable and adjustable and are not so firm yet supportive enough. The main disadvantage of buckwheat pillows is that they could create a noise, which could be irritating when the pillows are moved. These pillows are suitable for combination sleepers who prefer a high loft and who are not affected by the noise they create. This type of pillow is a great choice for them if they are looking for something that is supportive and comfortable.